River of Words is an annual event that gathers poetry and art inspired by rivers from children across the globe. This year the group chose a deeply insightful poem 'Rivers' written by seven year old José Perez from Florida as the winning riverpoem for 2007. 'A watershed is a marvelous thing to consider: this process of rain falling, streams flowing and oceans evaporating causes every molecule of water on earth to make the complete trip once every two million years.' Two million years! Two million years is length of the revolving water cycle and the ongoing relationship of living river to living ocean. This dynamic interconnection over such a long timeframe is now severely threatened. The World Wide Fund for Nature (WWF) has documented the litany of threat and disaster in it report World’s Top 10 Rivers at Risk' (2007). Two of the rivers singled out are the Murray and Darling rivers, the lifeblood of this nation. In addition to structural and flow concerns, the report outlines that another major threat to the Murray-Darling river system comes from invasive fish (e.g. carp) and plant species. For example, it mentions that in Australia, the numbers of feral fish species emanating from the aquarium trade has increased from 22 to 34 in recent years. 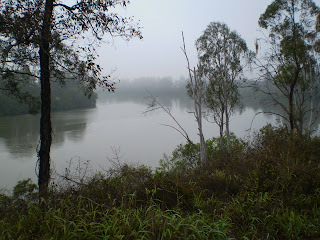 The Brisbane River is small fry in comparison although it too has its fair share of feral threats - some of them human. Recent media reports have raised the ire of locals through their focus on one aggressive visitor to the river, the famed Bull Shark. Locals (interviewed by the media) are decidely edgy about what is considered 'one of the most dangerous sharks in the world' (ABC Catalyst, 2003). Earlier this year the Daily Telegraph (UK) carried an article about the dangers of Bull Sharks and how Queensland locals are dealing with them. I wonder who is monitoring these aggressive actions against these creatures. Another local commented that he's 'caught a dozen sharks from his sixth-floor balcony in between playing video games and watching television. 'We sit in the lounge room with the rods set up and play the PlayStation, waiting for the bites.' While a third fisher sets up his fishing gear then 'retreats to his living room to watch DVDs' until he hears there's a bite on the line. The Daily Telegraph article continued: 'Fisheries officials say they are opposed to a shark cull and people must learn to live with the potential man-eaters. 'They have as much right to be in the water as we do,' said Jeff Krause, district manager of the Queensland Boating and Fisheries Patrol'. But the concern is that there is little attention paid to this living room culling of these special animals. Are there bag limits on taking Sharks? And how is it patrolled when people are fishing from their sofas?